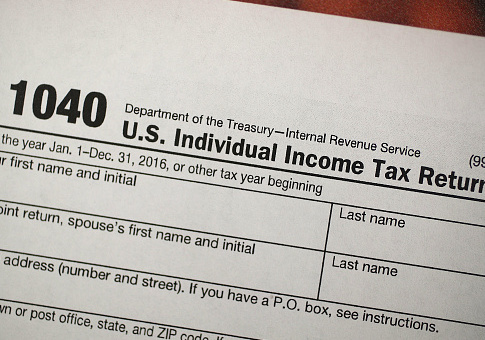 The top half of taxpayers paid more than 97 percent of the total individual income taxes collected in 2015, according to a report from the Tax Foundation. The foundation evaluated the most recent data on tax year 2015 from the Internal Revenue Service, which shows a progressive tax system with taxes paid by mostly high-income earners. The study splits taxpayers in half, with the top 50 percent of taxpayers classified as those earning more than $39,275 in adjusted gross income and the bottom 50 percent of taxpayers earning less than that. The top half of earners paid the majority of taxes, or 97.2 percent of individual income taxes, and the bottom half paid only 2.8 percent of these taxes. In addition, the top 1 percent of taxpayers, those who earn an adjusted gross income of $480,930 or more, paid 39 percent of individual income taxes, while the bottom 90 percent paid 29.4 percent. Top earners also paid an effective income tax rate of 27.1 percent, while the bottom 50 percent paid an average rate of 3.6 percent. "In 2015 IRS data show that taxpayers with higher incomes pay much higher average income tax rates than lower-income taxpayers," the report states. "As household income increases, the IRS data show that average income tax rates rise. For example, taxpayers with AGIs between 10th and 5th percentiles ($138,031 and $195,778) paid an average effective rate of 14.0 percent—nearly four times the rate paid by those in the bottom 50 percent." In total, there were 141.2 million taxpayers who paid $1.45 trillion in individual income taxes. These individuals earned $10.14 trillion in adjusted gross income. The $1.45 trillion in taxes that taxpayers paid in 2015 increased by 5.8 percent from the previous year. "The most likely explanation behind the higher tax rates in 2015 is a phenomenon known as ‘real bracket creep,'" the report states. "When incomes rise faster than inflation, more income is pushed into higher brackets and thus becomes subject to higher tax rates."